HardSoft’s First iMac Test Zone opens in Shoreditch for you to come and Play or Road Test an iMac. Have you wondered whether an iMac would work for you? Or with Apple’s new release what model is most suitable? Well, now you can try out the new 2019 iMac and the iMac Pro in our new HardSoft iMac Test Zone. Apple announced updates to the iMac range last month and this will be an opportunity for you to get your hands on the new machines and find out what they can do! The biggest difference between the new iMac i9 and the iMac Pro is of course their processors. 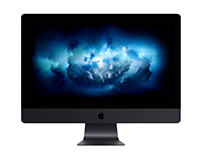 The iMac Pro with its Xeon processor has many cores sharing the load to handle large tasks such as hyper-threading for live editing. Whilst the 2019 iMac has an i9 Intel Core processor with a single larger core. The machine that’s best for you will depend on the tasks you need it to handle, and you can use the opportunity to understand which would work best for your business set up in our Test Zone. We will be running two types of session in the Test Zone; a 1-hour Play session or a 2-hour Test Drive session. Bring your own files along to test or the iMacs will have various software available for you to use, such as the Adobe Creative Cloud suite, plus testing software to push the limits of their systems. If you just want to give the New iMacs a try, then book a Play session where you can come and ‘play’ to your heart’s content for an hour. If you want to find out whether an iMac would work for you with a particular task or project in mind, book a Test Drive session and bring some files with you and you will have two hours to work on those files to discover how the iMac performs for you – don’t worry, we’ll make sure all the files downloaded are securely wiped from the iMacs so your data will be safe! – you can also send us files to download for you before your session if you’d prefer. The HardSoft iMac Test Zone will run from Wednesday 1st to Friday 3rd May. If you would like to book a Play or Test Drive session, please get in touch with our Business Development Manager, Sophie Morgan, on sophie.m@hardsoft.co.uk. 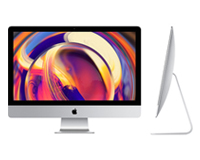 If you would like to find out more about the 2019 iMac range in general, give our knowledgeable sales team a call on 020 7111 1643 or email sales@hardsoft.co.uk. You can also contact them using the web chat facility on our website.